A few months ago, the Greater Las Vegas Association of Realtors (GLVAR) revealed Las Vegas home prices are up nearly 13 percent year-over-year and condos and townhome prices are rising at a much faster clip than single-family homes. That finding rings especially true for DK Las Vegas, a portfolio of condominiums including The Ogden and Juhl in Downtown Las Vegas and One Las Vegas on South Las Vegas Blvd. that has celebrated unprecedented home sales, even setting records this summer. “Because our success is truly measured in the numbers, we are constantly monitoring our performance and evaluating how our communities measure up amongst others in the valley. Luckily, we are constantly seeing our team’s efforts pay off,” said Uri Vaknin, a partner at KRE Capital LLC, which in partnership with Dune Real Estate Partners acquired DK Las Vegas in 2013. According to recorded sales rankings, One Las Vegas was ranked number one ranking in Las Vegas for home closings over the past six months, while The Ogden comes in strong at number four. At One Las Vegas, a 2,854-square-foot penthouse recently sold for $1,161,900, the equivalent of $407 per square foot. The sale, made to a California resident, is the most expensive residence sold to date in the entire portfolio since DK Las Vegas acquired it in 2013. At The Ogden, a 2,044-square-foot condominium recently sold for $699,900, which equates to approximately $342 per square foot. The floorplan, The Goodman, is one of several that comprise The Ogden’s Premier Collection, an elite collection of highly upgraded residences that according to Vaknin, are selling faster than the property’s smaller, less expensive homes. In fact the majority of residences sold throughout the entire portfolio are among the largest and most luxurious of the available condos, evidence of a national and local trend that today’s buyers are seeking higher-end homes. At One Las Vegas, residents not only have access to spacious and sky-high floorplans with panoramic views of the mountains and city lights, residents also enjoy resort-inspired amenities. “Amenities often top the list for residents seeking a resort-like lifestyle created by our two-story, state-of-the-art fitness center, a resort-style pool with Martinique daybeds, cabanas and spacious spa, to name just a few. Yet there’s so much more at One Las Vegas., including guard-gated security, full-service concierge, onsite management, full-size climate controlled storage units and covered parking garage,” said Vaknin. “We know that buying a home at One Las Vegas is about more than just finding the perfect floor plan. It’s a lifestyle change, so our resident-only events curated and executed by the community’s own lifestyle director are designed to help residents meet neighbors and make friends who share their interests and lifestyle,’ said Vaknin. 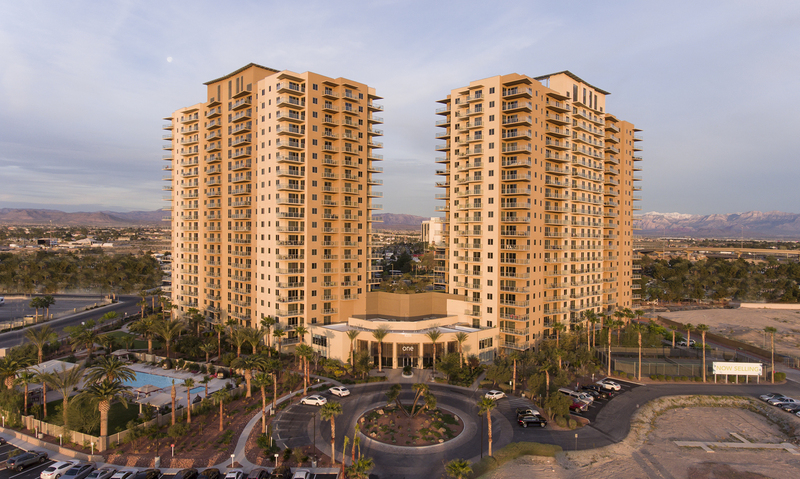 “We are thrilled to be at the epicenter of such wonderful changes happening in our city and even more excited to be able to offer such a diverse range of condominium homes in Las Vegas. The addition of professional sports teams like the NHL’s Vegas Golden Knights, the WNBA’s Las Vegas Aces and coming soon, the NFL’s Raiders, adds the final element previously missing in our world-class city,” added Vaknin. One Las Vegas homes range from 1,252 to 2,857 square feet with many floorplans offering spectacular views of both the mountains and the Strip. Two-bedroom homes are priced from the mid $300s and three-bedroom homes from the high $400s. For more information, visit www.theonelv.com. Available homes at The Ogden range from a two-bedroom, 1,180-square-foot residence priced from the high-$300,000s to a four-bedroom 2,044-square-foot home starting in the mid $600,000s. For more information, visit www.Ogdenlv.com.